For the last 12 years of my teaching career, I have used the same behavior chart- a color coded card system. Many of you may have used this system as well. Each student gets 4 color cards (green, yellow, blue and red). Each day all the students would start in green. They would either stay on green or move to the other colors when their behavior was not super stellar. The system works, but it is definitely is not perfect. The thing that I disliked the most about it, was that it was always negative. They were changing their cards for doing something wrong and not being rewarded for doing something right. There were years when I would let the kids change their cards back if their behavior improved but it never really stuck. So this year I have decided to do something different. 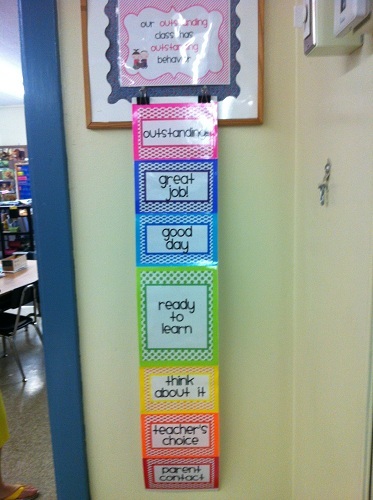 I have "graduated" to the behavior clip chart. I am really excited to use this system. I made a chart before the end of this school year (see pic below) but I have already made some adjustments and I am going to make another one. I have time, so why not make it perfect? I am using the same colors and wording. I have changed the background to chevron instead of polka dots because I am going to be using the chevron pattern as much as possible in my room this year. 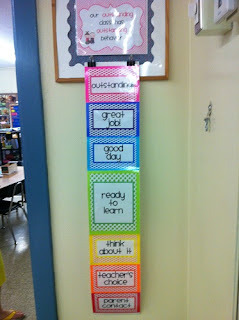 I also want to mount the signs on sturdier paper before I laminate it, so that it will last the entire school year. Each student will have a clip with their name on it and start the day in the green section-READY TO LEARN! Now they have the ability to move up 3 spaces to the top for awesome behavior through out the day and 3 spaces below the green section for not so great behavior. I am only going to allow students to move one section at a time. If they have a great morning and move 2 spaces to GREAT JOB, and then have a rough afternoon, they possibly could end their day 2 spaces down to READY TO LEARN. It seems so much more positive than my old color card system. Now they next part of my system is what the parents like the best. Each week on Friday their child comes home with their weekly behavior chart. The students color in a circle with the color their clip is on at the end of the day. This way the parents can review their child's behavior throughout the week and discuss what worked or didn't work for the child during the week. The parent signs the form and the student returns it on Monday. When the student returns the signed form I give them tickets, which is what I use as part of my reward system in my class. This provides student and parent "buy in". I also have a student form that gets filled out by the student when I want them to reflect on their behavior in class. The student, parent and teacher need to sign it because we are a team that needs to work together. Sometimes I have students draw a picture instead of writing if I think it is easier for them. You can grab the clip chart, directions, and behavior forms at my TpT or TN stores. What behavior systems do you use in your classroom that you really love? I love the clip chart. I have used it for 2 years. The only issue I have still not figured out is what to do when a student has clipped up two or three places then they act up. When they clip down, they are still in a "safe" color and don't seem to think they need to change the behavior. Last year I tried having them go straight to yellow then climb back up. It worked for some kids, but not all. Any suggestions.